This donor wanted to make sure that recipients were chosen who specifically asked for what she wished to donate. 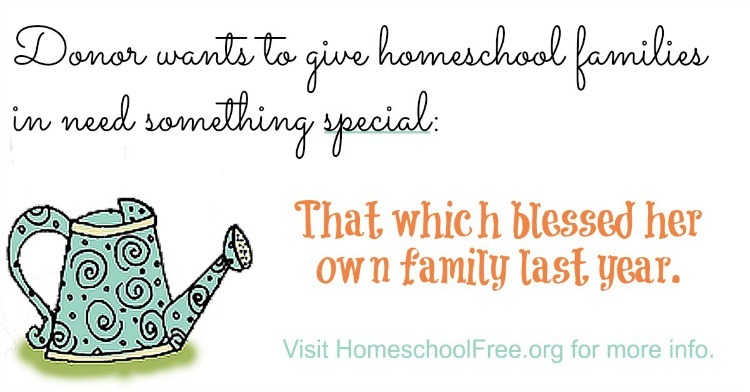 Homeschool Curriculum Free for Shipping helped her give brand new, unused curriculum, anonymously. The donor in this case is paying forward what she received last year. She says she received some of these things from donors herself, and these items have helped her homeschooler out tremendously. Things are looking up for her, and she wishes to give back. She's donating BRAND NEW Life of Fred, Story of the World, and math games to two families who specifically asked for them! There were two families who are receiving this, our 15th donation! The first family is starting over after the father lost his job. They moved to a new state and lost most of their curriculum. They asked for Life of Fred and games to help teach Math. The second family recently lost their home to a house fire. Nothing was salvageable, and all the chidren's curriculum was lost. They are currently living in a hotel until living arrangements can be made. Story of the World will come in handy to them, not taking up much space and allowing multiple children/ages to work together for History studies.